Explain taxation terms in detail. Under section 80C of the Act, an assesse, being an individual or HUF, is eligible to claim a deduction upto an aggregate of Rs. 1.5 lacs on account of sums paid as subscription to units of an Equity Linked Savings Scheme. The expression "Equity Linked Savings Scheme " refers to Equity Linked Savings Scheme, 2005 as notified by the Central Board of Direct Taxes, Ministry of Finance vide notification dated November 3, 2005 as amended vide notification dated December 13, 2005. Under Chapter VII of Finance (No. 2) Act, 2004 the unit holder is liable to pay Securities Transaction Tax (''STT'') in respect of "taxable securities transaction" at the applicable rates. Taxable securities transactions include purchase or sale of units of an equity oriented fund, entered into on the stock exchange or sale of units of an equity oriented fund to the mutual fund. The seller of units of an equity oriented fund is liable to pay STT (w.e.f. 1st June, 2013) where the purchase and sale is entered into on a recognized stock exchange and the contract for the purchase and sale of such units is settled by actual delivery or transfer of such units. At the time of sale of units of equity oriented fund to the mutual fund, the seller is required to pay an STT @ 0.001%. The securities transaction tax paid by the assesse during the year in respect of taxable securities transactions entered in the course of business shall be allowed as deduction under section 36 of the Act subject to the condition that such income from taxable securities transactions is included under the head ''profits and gains of business or profession''. Units held under the Scheme of the Fund are not liable to wealth tax as it has been abolished with effect from financial year 2015-16. Under the provisions of section 10(35) of the Act, any income (other than income arising from transfer of units) received by any person in respect of the units of the mutual fund is exempt from income tax. Dividend Distribution Tax (DDT) is paid by Debt funds & Equity Oriented Funds on the dividends before it is distributed. The rate of DDT depends on the type of fund and type of investor. Gains arising on transfer / redemption of Units as well as switching between schemes will be chargeable to tax under the Act. The characterization of income from investment in securities as ''business income'' or ''capital gains'' will have to be examined on a case-to-case basis. The Gift -Tax Act, 1958 has been repealed since October 1, 1988. Gift of units of Mutual fund units would be subject to income-tax in the hands of the donee (receiver of gift). As per section 56(2)(vii), receipts of securities, fair market value of which exceeds fifty thousand rupees, without consideration or without adequate consideration is taxable as income in the hands of individuals / HUFs. Further the above provision of section 56(2)(vii) shall not apply to any units received by the done. g. From any trust or institution registered under section 12AA of the Act. Investors choose between growth, dividend and reinvestment options based on their need and the tax implications. Please explain Mutual Fund Taxation in India in detail. Capital Gain is appreciation in the value of asset – if you buy something for Rs. 1 Lakh & sell it for Rs. 1.5 Lakh, you have made a Capital Gain of Rs. 50,000. Capital Gains are further divided into short term & long term depending on their investment horizon. Short Term Capital Gain arises in case of equity oriented schemes if investment is held for 12 months or less or in simple words sold on or before completion of 1 year. In case of other than equity oriented schemes Short Term Capital Gain arises if investment is hold held for 36 months or less or in simple words sold on or before completion of 3 years. Long Term Capital Gain arisesin case of equity oriented schemes if investment is sold after 1 year and in case of other than equity oriented schemes if sold after 3 years. Mutual Fund Capital Gain Tax further depends on which type of fund it is – Equity or Other than equity. Dividend taxation rate depend on which type of Mutual Fund you are investing in – Equity or Other than equity. In case of Mutual Funds – dividends received by investor are tax free in their hand or they don’t need to show it as a taxable income. But there is dividend distribution tax paid by mutual funds to income tax department. Please explain Taxation with respect to all your Schemes? 10% + Applicable Surcharge + 4% Health & Education cess The amount of *capital gain in excess of Rs 1,00,000/- in a year will be taxable @ 10%, However relief to the extent of capital gains as on 31st January, 2018. * The mentioned tax rates shall be increased by applicable surcharge, if any and Health & Education Cess @ 4% . This shall apply to all the categories of tax payers. Equity oriented schemes will also attract Securities Transaction Tax (STT) @ 0.001% at the time of redemption and switch to other schemes. Mutual fund would also pay Securities Transaction Tax wherever applicable on the securities bought/sold. For further details on Taxation please refer the clause of Taxation of SAI and read respective SID. What is the Tax payable on dividend, received by me as an investor? Dividends received by investor are tax free. 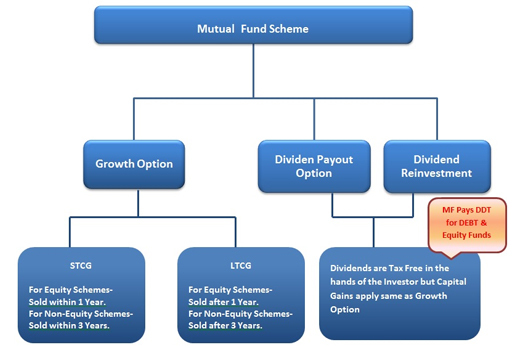 While distributing dividends; do the respective mutual fund schemes pay any tax? What is CII and Indexation method used for computing Capital gain? Explain the working. Cost Inflation Index (CII) is a figure that is announced by the tax authorities each year that represents the impact of the inflation in the economy. This is a figure that will determine the extent of the benefit that the individual will receive on their investments when they sell them and a capital gains tax has to be paid on it. This index is then multiplied by the cost of the purchase to arrive at “indexed cost”. Please note that as per the present taxation rules, it is mandatory for resident individuals to apply above indexation method while calculating long term capital gain tax on Debt Funds. Therefore tax payable @ 10% (excluding applicable surcharge and cess) of Rs. 90,00,000 would have come to Rs. 9,00,000 !! What are the tax slabs for Short Term Capital Gains and Long Term Capital Gains? 10% Applicable Surcharge + 4% Health & Education Cess The amount of *capital gain in excess of Rs 1,00,000/- in a year will be taxable @ 10%, However relief to the extent of capital gains as on 31st January, 2018. Equity oriented schemes** 10% + Applicable Surcharge + 4% Health & Education Cess The amount of *capital gain in excess of Rs 1,00,000/- in a year will be taxable @ 10%, However relief to the extent of capital gains as on 31st January, 2018. $ Surcharge at the rate of 10% shall be levied in case of individual / HUF unit holders where their income exceeds Rs 50 Lakhs to 1 crore or 15 % shall be levied if income exceed Rs. 1 crore. $$ Surcharge at the rate of 7% shall be levied for domestic corporate unit holders where the income exceeds Rs 1 crore but less than 10 crores and at the rate of 12%, where income exceeds 10 crores. *The short term/long term capital gain tax will be deducted at the time of redemption of units in case of NRI investors only. ** STT @ 0.001% will be deducted on equity funds at the time of redemption and switch to the other schemes. Mutual Fund would also pay securities transaction tax wherever applicable on the securities bought / sold. What are the Capital Gain Tax rates for NRIs and how will you process the same? For NRIs in case of Short Term Capital Gain there will be a TDS (tax deducted at source). Which means Tax will be deducted by Mutual Fund Company before paying redemption (sell) amount. What are the Income Tax slabs for 2018-2019?